There must be a better way to see art,” writes Jerry Saltz in New York magazine. Saltz crystallizes many of the complaints we heard this spring from people preparing for a summer pilgrimage to Europe. Is the tide turning against super-shows? Check out Saltz’s thoughts. Of the 36 or so public sculptures on view in the Skulptur Projekte Munster, only a handful really shine, but the scenery of the city of Munster, and the way the works interact with the local history, landscape and architecture make the stop on this grand tour well worthwhile. Munster is a much more picturesque and lively city than Kassel, and the one day we spent walking around it hunting for sculpture didn’t seem nearly long enough. There’s unpredictable weather to contend with when visiting the sculpture fair, because everything is outdoors. It’s much more pleasant to undertake this treasure hunt on a sunny day than in the rain. The day we were scheduled to depart was sunny (as opposed to rain on the day we arrived) and I wished that I could have stayed and spent more time exploring the city and its outlying areas on bicycle. Just a little south of the center of town, there’s a man-made lake surrounded by greenery and trees. The lake has kind of a strange name - Aasee. Who knows, maybe that means “little sea” in German. Polluted, man made sea would be a more apt name because the water’s pretty grimy and toxic from all the pesticides that flow in from the agricultural runoff. 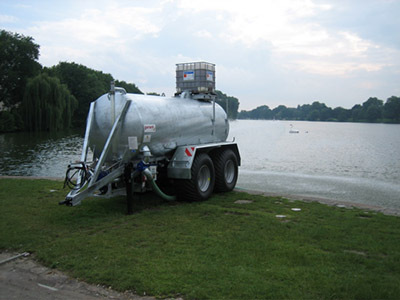 One of the artists in the sculpture fair, Tue Greenfort, has taken this environmental degradation as a point of inspiration and decided to try and filter out the toxins by running the lake water through a special filtration truck that mixes it with iron chloride, a compound that neutralizes the toxins. It’s a futile act, of course. The lake is huge, and no matter how much iron chloride you pour into it, it won’t get clean because the pesticides keep flowing into it. Nonetheless, Aasee provides a very scenic setting with a footpath that encircling the lake, willow and linden trees, fields of purple, white and red wildflowers and bandtailed pigeons that nest in the trees. A little further out in the middle of the lake, we saw what looked like another work of public art (btw, it’s very hard to try and decipher what in Munster has been erected for the sculpture fair, and what was a pre-existing element of the urban architecture, because some of the projects blended so seamlessly with their surroundings). This work (or what we thought was an artwork) looked like a floating raft shaped like a giant swan. We asked one of the guides who was stationed at each sculpture project, if this swan/raft was part of Tue Greenfort’s piece, and she said it wasn’t but was glad we asked. She proceeded to tell us the story of why this raft was tied down in the middle of the lake. She pointed at a real swan that was swimming beside the raft and said that this swan had fallen in love with it’s Amazonian, fiberglass counterpart, and wouldn’t leave its side. The swan was so attracted to the raft, that when it was taken to the zoo to live there during the winter months, they had to bring its fiberglass mate along so that it wouldn’t get lonely. The guide explained that everyone in Germany knew the story of this swan because it had been in all of the papers and on tv, and seemed to take great pride in this local celebrity. Another project on the banks of Lake Aasee was made by German artist Rosemarie Trockel. Trockel has become one of my favorite living artists. She works is so many different types of media, yet each of her projects is so intelligent, witty and well executed. “Less Sauvage Than Others” looked like maybe 20 or so pine trees (about the size of large Christmas trees) planted up close to one another and trimmed to resemble a rectangular, high modernist brick. It was situated close to, and undoubtedly referenced, a permanent concrete sculpture erected by Donald Judd for the inaugural 1977 Sculptur Projekte. Unlike Judd’s high minimalist work, however, with its perfect angles and measurements and its smooth surfaces, Trockel’s minimalist hedge was clipped unevenly. The rectangle wasn’t straight, but kind of bowed, and there were choppy parts all around it, so that it looked like it had received a really bad haircut. The cheerful guide in attendance told us that this was Trockel’s comment on German society, with its strict rules and it’s emphasis on perfection. It was Trockel’s way of inserting some irregularity into its midst. Maybe Trockel can do a project with the Documenta guards for the next Documenta exhibition. I found their strict adherence to rules and their countless reprimands quite oppressive and distracting as I was trying to look at and comprehend the works on view there. They could have learned a thing or two from the helpful art guides at Skulptur Projekte Munster. There was another project on banks Lake Aasee by artist Pawel Althamer that I regret not to have experienced in full. We walked around in circles trying to find it in the middle of a grassy field, then bumped into the Canadian sculptor Lucy Pullen (who, btw, is very talented sculptor in her own right) who tipped us off. She explained that the project is a footpath worn into the grass, the beginning of which is marked by two bicycles locked to a pole. I looked down the path, and it seemed to stretch on for quite a ways, and disappeared behind a hill. It was starting to rain harder, and it was getting to be near dinner time. Plus we weren’t on bikes, so the thought of navigating this path on foot in the rain as the sun was starting to set was a little daunting. Building up the mystery and suspense of the piece, Lucy said we had to see it, and made us promise to return to the path with bikes the next day. We never made it back, unfortunately. So if anyone reading this goes to Munster and follows Althamer’s path to the end, would you be so kind as to tell me what’s there? Robert Storr’s exhibition for the Venice Biennial has a two part title: “Think With the Senses, Feel With the Mind.” His exhibition is also divided into two different parts, one at the Italian Pavilion in the Giardini and another, more substantial one at the Arsenale. The two exhibitions couldn’t be more different than one another, so I am trying to figure out if one part of the title is meant for one exhibition, and the other part of the title meant for the other exhibition. If that’s the case, then Feel With the Mind would refer to the display of work at the Giardini. This is a large group show that focuses on formally sophisticated work with conceptual underpinnings by well established artists such as Bruce Nauman, Nancy Spero, Kara Walker, Susan Rothenberg, Franz West, Louise Bourgeois, Lawrence Weiner, Sol LeWitt, Susan Rothenberg, Felix Gonzalez Torres, Giovanni Anselmo, and Sophie Calle, among many others. My guess is that these were artists Robert Storr had a history of working with before… the canon of influential contemporary artists, as marked with MoMA’s stamp of approval. Most of the work looks familiar, has been exhibited numerous times before, and therefore isn’t that exciting to encounter at the Biennale. There were a couple of discoveries for me, however which made this portion of the exhibition somewhat worthwhile: a painter from Congo named Cheri Samba who visualizes the Sodom and Gomorrha theme in present day street life in Italy, and an artist named Ignasi Aballi who documents all of the languages spoken in the world. Storr’s exhibition at the Arsenale is far more interesting and unabashedly political in a left leaning way. I believe that Think with the Senses is a more apt title for this exhibition, because most of the work is highly conceptual and content heavy, involving alot of text, a lot of videos with lenghty dialogues, and a lot of documentary photography. But the work is also intriguing enough and asthetically sophisticated enough to appeal to the senses. 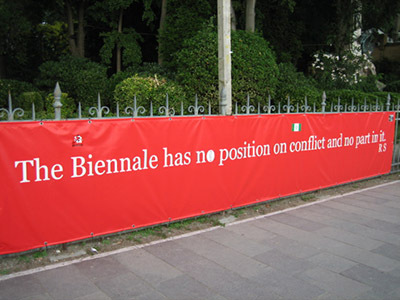 Storr may have encountered alot of opposition for his critical stance of the US and Israeli war machine, because there is a giant disclaimer in the form of a banner hanging in the promenade between the Giardini and the Arsenale, which states “The Biennale has no position on conflict and no part in it.” The highlights of the exhibition for me are contributions from a couple of emerging Italian artists: Gabriele Basilico shows a series of haunting photographs of Beirut in 1991, taken after the Israeli bombings. Beautiful, architectural treasures, many of them looking like some of the buildings one would see in Venice, are completely gutted by bombs. It looks like an archeological remain… a wasteland demarcating the remains of a civilization that had once been culturally rich, but is now extinct. A similar theme is invoked by video artist Paolo Canevani. It is shot from an insect’s eye view and shows an apocalyptic scene of a young boy playing soccer by himself in a grassy field in front of a bombed out building. But rather than kicking around a soccer ball, he is playing soccer with a skull. Unlike Basilico’s photos, which are completely devoid of people, there are signs of life in the midst of war in Canevani’s video. One can see an occasional car passing by on a far off street. But the piece leaves you with the troubling question of the aftermath of the trauma of war, and how it may impact future generations. Life goes on, but in how demented a way? The label of the piece indicates that this scene was shot in Belgrade. The African, Turkish and Chinese pavilions are situated in the Arsenale by invitation from Storr. In the African pavilion, I was most captivated by an installation of black lights by Kendell Geers. He’s written all of the vices in black light in a kind of mirror effect that makes the words difficult to decode. I liked the way the black lights appeared to darken everyone’s skin color who walked into the room. The visitor with even the palest skin looked black, contrasted with the whites of their eyes and their teeth. Also in the Arsenale, the Italian Pavilion is hosting one of the most striking installations by bad boy Francesco Vezzoli. A two channel video projection titled “Democracy” shows two spoof political ads for two presidential candidates, the two videos projected on opposite sides of a circular viewing room decorated with stars and blue and red balloons one would find in a political convention. Patricia Hill, whose voice and statements bear a striking resemblance to Hillary Clinton, is played by Sharon stone. In the ad, Hill/Stone regurgitates empty catchphrases such as “peace is taking care of one another” and “peace is making America proud of itself again.” The other candidate, a certain Patrick Hill, is played by a famous French philosopher named Bernard-Henri Levy. Unfortunate for him, he doesn’t have the same recognition as Sharon Stone, and therefore not a chance of winning the race, in my opinion. In the ad, he is described as a “writer, a professor, and an intellectual,” which, of course, is completely absurd. Can anyone imagine an “intellectual” having a real shot at the US Presidency? Patricia Hill/Sharon Stone had a very clear advantage over the philosopher/intellectual, however, not only because she is more famous, but because the audio on her video was turned way up. You could barely hear what Hill/Levy was saying. I don’t know if this was intentional on the part of Vezzoli (maybe it’s a suggestion that the candidate with the most visibility, most recognition, and the loudest, most prominent ad campaigns will win?) but one thing that was clearly communicated by Vezzoli’s piece was just how similar the candidates for the two party system are. Patrick or Patricia? They appear to be two sides of the same coin. I’ll write more about the individual national pavilions in my next entry. Psychologist of art Rudolf Arnheim died this weekend at the age of 103. Among Arnheim’s most influential works were Art and Visual Perception, Toward a Psychology of Art, and Visual Thinking. Jessica Hough starts this week as the new director of the Mills College Art Museum. Hough comes to Mills from the Aldrich Contemporary Art Museum in Ridgefield, Connecticut. Hough will lead the museum in bringing a planned new wing into being, in addition to overseeing the program of contemporary art exhibitions and a collection of more than 8,000 objects. Hough (pronounced “how”) is known for her exhibitions of contemporary American and international art. She was responsible for organizing a show of the photography of Catherine Opie, “In and Around Home.” Hough appears with Opie in a television interview posted to the Aldrich Web site in 2006. Hough also collaborated on organizing “Karkhana”, an exhibition of six contemporary Pakistani artists recently featured at the Asian Art Museum in San Francisco.